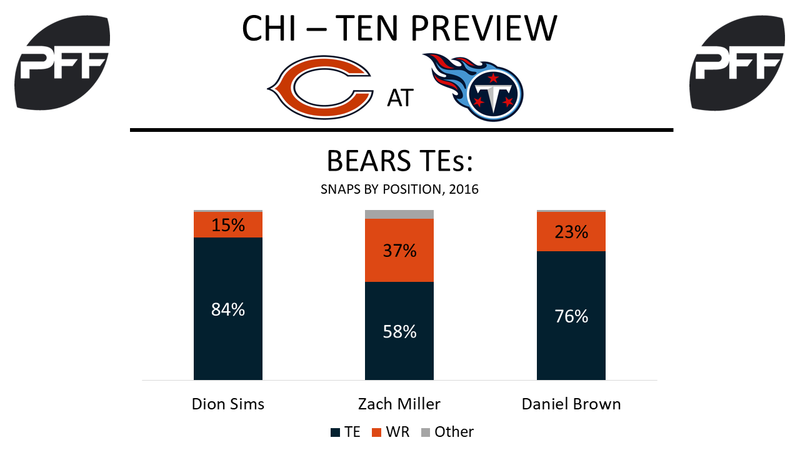 The Bears know Dion Sims will be their starting tight end, but the depth chart behind him remains up in the air. Last year, Miller was the number one tight end, but he ran 47.4-percent of his routes out of the slot. That hasn’t been the case this preseason so far, as 24 of his 30 snaps have come at tight end, but 30 total snaps is fewer than both Shaheen (53) and Brown (33) through two games. He does lead all Bears tight ends with 5 targets so far, though. Shaheen brought some high expectations as a second-round pick out of Division-II Ashland, but he’s played poorly so far this preseason. He was the Bears’ lowest-graded tight end in both games so far, struggling as a run blocker and only receiving three targets, catching two of them for 12 total yards and dropping the other. Brown has had issues of his own, dropping two of his four targets while catching the other two for only 9 yards. 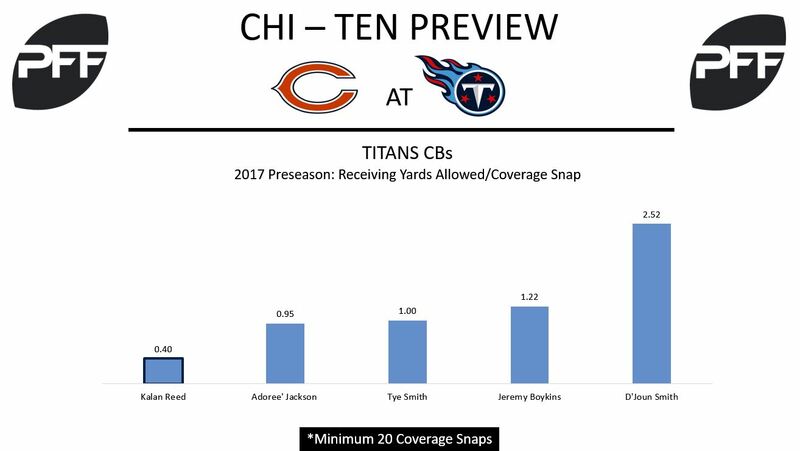 The converted wide receiver is considered a favorite of the coaching staff, and last year he played the most snaps of any Bears tight end over the final five weeks of the season. Benny Cunningham – Cunningham is currently the healthiest of the team’s running backs competing for the third spot on the depth chart. This preseason, he’s had the highest average yards after contact per carry (3.6) of all Bears running backs, more productive on his 10 carries than Ka’Deem Carey with the same number of handoffs. 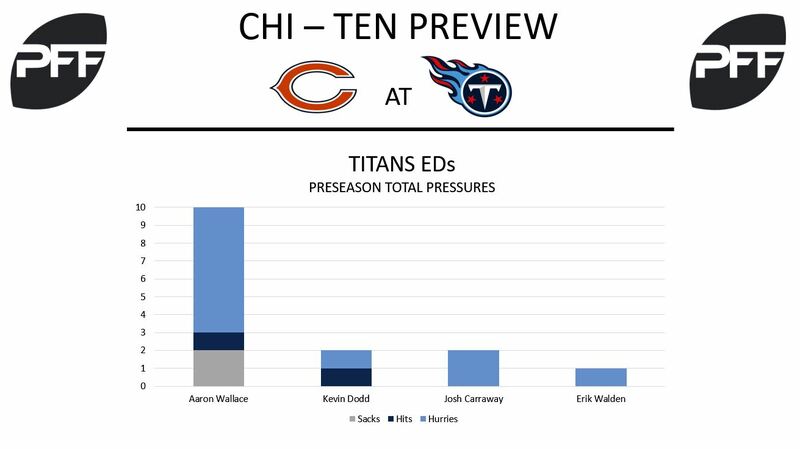 John Jenkins – Jenkins was quiet in the Bears’ first preseason game with only 13 snaps, but last week he was on the field for 32 and reasserted himself in the backup nose tackle competition. He earned a 78.8 overall grade against the Cardinals, the second-highest among defensive linemen on the team. B.W. 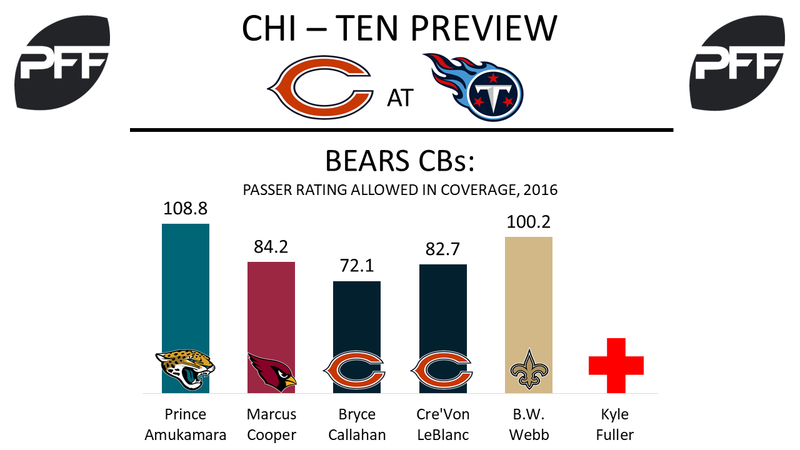 Webb – Webb has been the most targeted cornerback (11) on the Bears this preseason, and not surprisingly, he’s their lowest-graded CB so far. However, he’s also the only player in their secondary to record an interception this preseason, and he only allowed a passer rating of 55.5 in coverage, lowest on the team among cornerbacks with at least 10 snaps. Derrick Morgan and Brian Orakpo are locked in as the Titans’ starting edge defenders, but the battle to back them up with Erik Walden appears to be wide open. Wallace, a 2016 seventh-round pick, has been on a tear throughout the preseason. His 10 total pressures are the most for all 3-4 outside linebackers, and his 21.6 pass rushing productivity ranks second for the position. He registered a PFF overall grade of 88.7 last week, which was No. 4 among edge defenders. Dodd’s performance over the past two weeks has been underwhelming. He’s forced just two total pressures in 27 pass rush snaps, good enough for a pass rushing productivity of 5.6. Dodd also hasn’t forced a run stop in 23 run snaps. Jonnu Smith, TE — Smith forced two missed tackles and logged 36 yards after the catch last week. Both totals ranked third for his position. His 2.76 receiving yards per route run ranked him second. David Fluellen, RB – Fluellen made his case to be the Titans’ No. 3 back in last week’s matchup against the Panthers. Not only did he log a 53-yard run, but his elusive rating of 162.5 ranked seventh among qualified running backs. His average of 5.8 yards after contact per attempt this preseason ranks third. Kalan Reed, CB – Reed has been one of the Titans’ top graded players over the past two weeks. His overall grade of 88.2 against the Panthers earned him a spot on PFF’s Team of the Week. Despite facing 10 targets through two games, he’s averaging 0.40 receiving yards allowed per coverage snap, which ranks ninth among cornerbacks (min. 34 coverage snaps). Additionally, his three run stops are tied for the most at his position.